Thanks for the info, and the memories! I loved WUAB when I was growing up. I even enjoyed watching the test pattern sometimes. 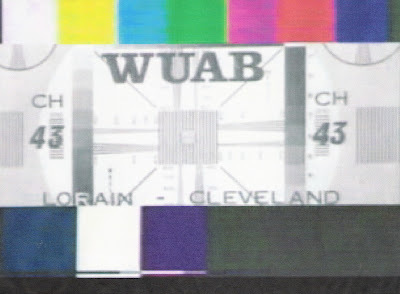 I hope that one day I'll see a video on YouTube of WUAB's sign-on from the mid 70's. I also remember Ch. 61; didn't their call letters change to WCLQ? I used to love watching the same movie 3 times over the weekend,4pm Saturday,11pm Saturday night, 1pm Sunday afternoon, especially if it was a good one. I think that was how I saw every Jerry Lewis and Dean Martin movie. Also Journey to the Center of the Earth starring James Mason & Pat Boone. My younger siblings and I know all the dialogue to that one. The only time I didn't watch their movies is if Big Chuck and Hoolihan/Lil' John had a "new" movie on. Oh thank you so very much for this! I remember living in Chagrin Falls, Ohio in the 70's and I loved this particular channel. I especially remember looking at The Flintstones and other classic cartoons that seem almost nonexistent today; either they've been thrown away or altered to suit the world today. Oh, I miss those days and find myself constantly revisiting those memories.